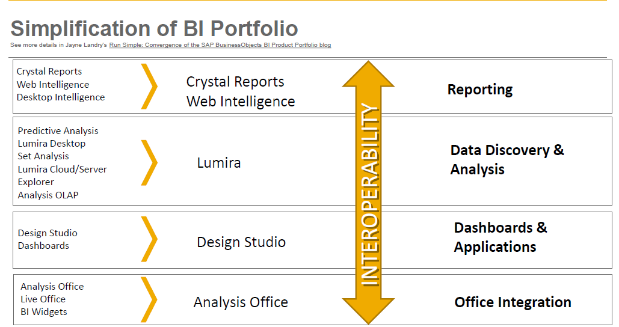 Being either SAP consultant or guy at SAP’s customer side we all know that there are many BI tools in SAP’s portfolio. Partially it is caused by acquisitions done by SAP over the years but also partially by SAP’s pursuit of new technologies and offerings built on top of them. Basically like in every part of life a lifecycle comes in place and the new offerings (Lumira) are supposed to replace old technologies/tools (BEx) in long run. It is clear that there has to be done something about all these tools. This is not only to relieve a worries of customers bit. But also as SAP is sticking to their newest strategy: Run simple as echoed in this year spring at annual SapphireNow conference in Orlando. As per run simple mantra it should be up to customers to keep existing BI content in place but from SAP side there is a focus on few core products allowing customers to do possible migration from existing tools to the new ones. Of course one can argument that tools which is supposed to left behind have features which are not included yet in those who are supposed to stay. There are issues like this but there is no “do migration now!” approach. Customers can keep using what they use at the moment but they should evaluate and test new things just in case to be prepared for migration which may come in future.